Great coffee starts with clean water. Luckily in Milwaukee we have some of the best water in the world (there's a reason we have had so many breweries in town). But that water quality from safety to taste is always under attack by environmental issues. Brewers - of beer and coffee and even tea - are part of the ongoing activism in making sure we always have good water. Local coffee roasters Colectivo Coffee are one of those. 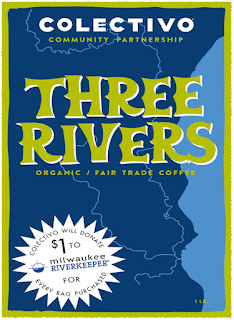 Colectivo has created a special edition Three Rivers with clean water in mind. For every bag purchased, Colectivo will donate $1 to Milwaukee Riverkeeper®. The combination of Fair Trade, organic selections from Nicaragua and Sumatra offers flavors of dark chocolate, orange, and dried fig with a hint of spice. The mission of Milwaukee Riverkeeper® is to protect, improve, and advocate for water quality, riparian wildlife habitat, and sound land management in the Milwaukee, Menomonee, and Kinnickinnic River Watersheds. They envision a future in which people from all walks of life can enjoy the healthy waterways of the Milwaukee River Basin. Help support clean water and strong communities! Learn more at milwaukeeriverkeeper.org. Head on over to a Colectivo near you and purchase your bag, its an easy way to support these important efforts for a community based around the lake and rivers.